Are you craving excellent food, live entertainment, and a relaxed atmosphere? Then there’s only one place to go: The Garage Pub and Grill! As Columbus’ best kept secret, The Garage is your 21+ destination for great meals, great music, and top-notch events. We have an extensive menu of appetizers, burgers, entrees, and sandwiches, and most of our food is made from scratch, on-site. From chicken wings to tenderloin, gluten-free to vegetarian, we take great pride in the quality of everything that we make, and we’re sure that it will satisfy your taste buds. We also carry an extensive range of drinks, too, so we’ll work to quench your thirst. In addition to our extensive menu, we are committed to providing the best live entertainment in the area. From featured bands that come through town, to regional acts that are eager to belt out a tune, we have five nights per week of live entertainment. In addition to the plethora of music we have, there’s also Tuesday Night Trivia and Thursday Night Karaoke, so you can get in the fun as well. Looking for a place to host your next big party? We have an event room that can hold up to 30 guests, has a 50″ Hi-Def TV, possesses blinds for privacy, and is even attached to a patio. We’ll take care of the cooking, cleanup, and everything in between — all you have to do is show up and have fun! What are you waiting for? 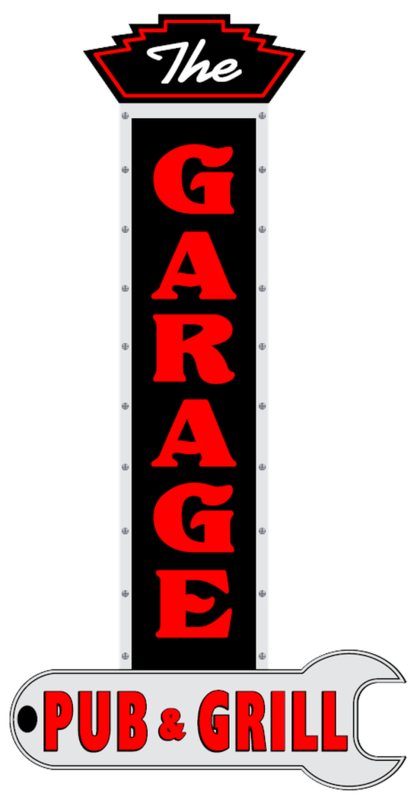 Come on down to The Garage, or give us a call at 812-418-8918!